Congratulations once again to the champ, Gary Hunt!!! And thanks everyone for joining us this afternoon! 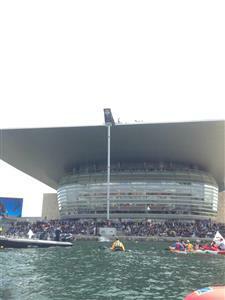 Stay tuned to redbullcliffdiving.com for diver reaction, photos and videos from an epic event in Copenhagen! Gary Hunt has made it four wins out of four in the 2015 World Series with victory in Copenhagen!!! All eyes are now on the last man up on top: Gary Hunt! It's not quite enough... only 7.5s from the judges and unless there's a big slip-up from Gary Hunt, Duque is not going to be on the top step of the podium. Third place is assured, however. YEAH STEVEN!!! ❤️ Good luck in the final, guys! Czech Michal Navratil is first up on the 28m platform for the final... He's not in contention for the win, but will be delighted to make the final here in Copenhagen. Such an exciting competition - so wished I had not missed seeing this stop live! I would really like and even pay for live streaming of the full events. Something to think about! I think there would be many who would...who agrees? And if you haven't voted for your winner in our poll then now is most definitely the time! That's a brilliant execution from Blake Aldridge! The Brit hits the hardest dive in the world, a reverse double somersault with five twists, to advance in his head-to-head against Todor Spasov. It also puts him in second place in the total scores behind Gary Hunt! Artem Silchenko executes his big back armstand dive, with a DD of 6.2, but there’s not going to be a repeat of the win he achieved here back in 2013. A short landing on entry and 5s from the judges mean that he’s out of the competition and it’s his friend Anatoliy Shabotenko who will advance to the final. After mixed weather for much of this week, we're set fair for the main competition day. 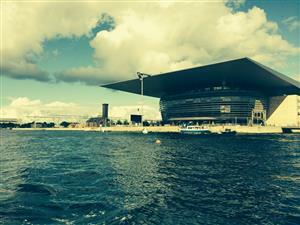 The diving gets underway at approximately 2.00pm CEST - 14 cliff divers will be launching off the roof of the Copenhagen Opera House and freefalling 28 metres! For live updates follow us here on redbullcliffdiving.com/live! Half an hour to go until the serious business of competition and 14 of the world's best cliff divers putting it all on the line from 28 metres! Time to put on that game face and shake off those jelly legs! We may have jinxed it with the weather! We've just had a pummelling of hailstones to go with the rain and the wind of earlier in the week! Fortunately the clouds are passing and there's still 45 minutes to go until the start of competition. The highest score for a single dive in Red Bull Cliff Diving World Series competition actually came at this very venue in 2013, when a back armstand from Russian Artem Silchenko achieved a so-far unsurpassed 183.00 points. Gary Hunt came very closing to beating that score at the last stop in Texas, but the record still stands... Will anyone break it today? If you're wondering how these dives are going to be scored, then here's how: Each dive is assigned a Degree of Difficulty (which generally speaking increases according to the number of somersaults or twists within the dive) - this varies from 3.8 (for the least difficult dives) to 6.3 for the most difficult. Five judges then score the dive, with the highest and lowest scores discarded. The remaining three scores are then added together and multiplied by the Degree of Difficulty to give the points total for the dive. We've got an expectant crowd gathering in Copenhagen! It's nearly show time! Call back on Saturday at midday (CEST) for live coverage of finals day of the fourth stop in the 2015 World Series in wonderful Copenhagen!